NintenGen: Download any movie and watch it on the Wii with this program! Download any movie and watch it on the Wii with this program! Have you tried to watch downloaded movie clips on your Wii stored on your SD card only to find that no matter what you seem to try it never works? 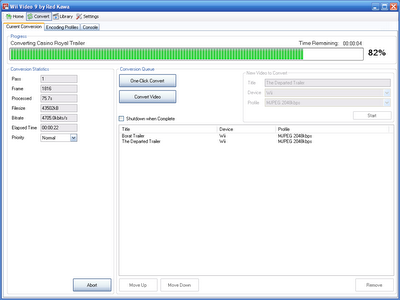 Well online site Redkawa has found a way to convert any video that you download from the internet to work on the Wii. Sadly the Wii only uses MJPEG to play movies. However, if you download a MJPEG movie clip from the internet and try to make it run on the Wii it usually never works and is very frustrating. This program makes any movie type work on the Wii, it doesn't matter what you used in the beginning since the converter will make all movies MJPEG. Set your Bitrate (kbps) to 8192 if you want the best and most clear quality on your movie conversion. It takes more space on your SD card but its worth it. I recommend a 2gb SD card, I would say a 4gb SD card but the Wii is only compatible with 2gb for now. Start downloading! I tried it and its not working for me. It's generating an AVI that the Wii claims is incompatible. Any one else seeing this? Great find as usual Metaldave. I will be sure to post this quality story on my site. The only thing I don't like about MJPEG is that it converts UP, meaning that the file size for a 5 meg video will go up to 15-20 megs when you convert. 1 episode of Family Guy will fill up your entire 2 gig SD card. Oh well, its good for short clips or trailers. When I have it convert for the Wii, it generates a .avi file. But, when I set it to convert for the PS3, it creates an MPEG, which works on the Wii. So, yeah.